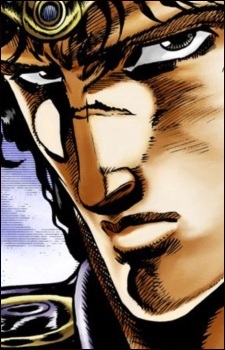 Bruford is an antagonist featured in Part I: Phantom Blood. He is a vampire made from the centuries-old corpse of a brave and powerful warrior of ancient Britain. Along with Tarkus, Bruford was one of "The Dark Knights". He also had unusual battle prowess and powers associated with his dark hair and his sword "Luck Pluck." Bruford and Tarkus were successful in the Challenge of the 77 in 1563, two of only five challengers to succeed in history. Prior to their corruption, Bruford and Tarkus were members of the Tudor Dynasty and retainers of Mary Stuart. Eventually they were beheaded for supporting Mary against her political rival, Elizabeth. However, Elizabeth's deception to force them to surrender led to a strong sense of betrayal that made them susceptible to manipulation by Dio. The pair were eventually resurrected as vampires by Dio Brando to oppose Jonathan Joestar, Will A. Zeppeli, and Robert Speedwagon. Bruford's manipulation of his hair poses much challenge to Jonathan, eventually leading to them fighting underwater, until Jonathan swims downward to find air bubbles beneath the rocks, enabling him to draw breath and hit Bruford with a ripple overdrive. Moments before he disintegrates from the ripple, Bruford gives Jonathan his sword, Luck and Pluck. However, his corpse is kicked aside by a wrathful Tarkus, who attempts to finish off Jonathan and party on his own.